Evidence for the existence and occupation of ancient Jerusalem dates back before even the Bronze Age, an Age stretching approximately from 3,300 B.C. to 1,550 B.C. Ceramic evidence has dated the ancient city into the Chalcolithic Period, ca. 3500 B.C. This Copper Age pottery indicates that the site of Jerusalem was in use well before it was ever mentioned in the Old Testament. Jerusalem history is scant from this time period, as is history in general. Very little is known of any civilization prior to 3500 B.C., though it is known that civilizations and cities were flourishing. Ancient Jerusalem seems to stretch back even to this most ancient and unknown of times. The first Biblical mention of Jerusalem is not under that name, but rather under the appellation Salem. It occurs in Genesis 14:18. This is one of the most mysterious verses in all of the Bible. "And Melchizedek king of Salem brought out bread and wine; now he was a priest of God Most High." This incident involved Abraham during his daring rescue of Lot from king Chederlaomer, who had previously laid waste Sodom and Gomorrah and taken Lot captive. 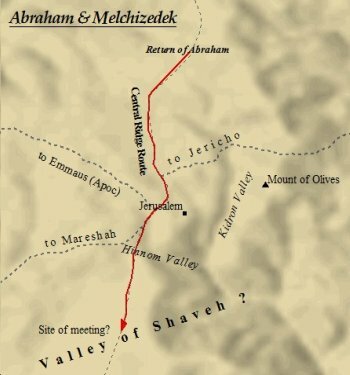 Upon returning from his successful campaign, Abraham met Melchizedek, the mysterious priest of El Elyon ( God Most High ), right outside of Salem, or ancient Jerusalem. Melchizedek, at this point in history, was the king of Salem. This would later be the site of the Amorite city Jebus, and later the capital city of king David and Israel. Ancient Jerusalem passed through many hands prior to David's. 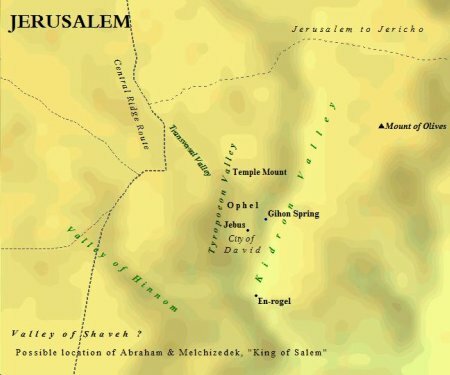 A map of ancient Jerusalem during the days of Abraham. Without delving into the controversial dates surrounding these events, it is generally agreed by scholars that Abraham existed in the Middle Bronze Age, more specifically around 2000 B.C., though exact dates vary. His migration patterns match those of the time period, a possible result of instability in and around Ur in southern Mesopotamia, also in accordance with a historical context from around 2000 B.C. 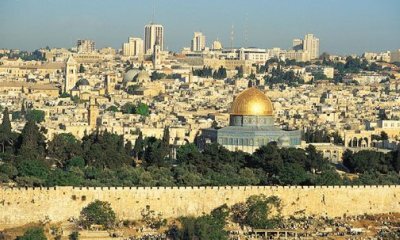 Ancient Jerusalem would have been an occupied site during this time period as well. An archaeological find in the north of Canaan, along the coast, produced some remarkable documents from the early 3rd millennium B.C. The discovery of Ebla (Tell-Mardikh) has shed an invaluable light on the history of this region. In its prime, ca. 2300 B.C., Ebla was an ancient city of towered, three-storied buildings. It was a major trading power, thus an economic power in Syria and Canaan. Ebla traded mainly in timber, copper, and precious stones. The site of the discovery covered 140 acres. Perhaps the most astonishing discovery was a treasure trove of over 1,500 clay tablets. These tablets were written in a form of cuneiform pictographs, credited to a language that is best characterized as belonging to the same northwest Semitic tongues as Hebrew. It has even been suggested that this language at Ebla may even be the ancestor of Hebrew. Regardless, these tablets provided a wealth of new information. The Ebla tablets make mention of cities such as Jerusalem, Hazor, Lachish, Megiddo, and Acco. 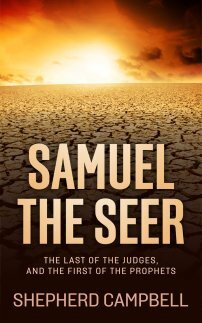 Also, personal names such as Esau, Ishmael, David, Saul and Israel appear in these texts. None of these names, however, have shown links to their Biblical counterparts. They do attest to the commonplace use of such titles and names in the culture of the day, however, and would seem to corroborate the other evidence suggesting Jerusalem's antiquity. In these texts the name of ancient Jerusalem appeared as Ye-ru-sa-lu-um. Other texts mentioning Jerusalem are from Egyptian Execration Texts dating from the 20th to the 18th centuries B.C.E. The earliest of these texts date from the early Twelfth Dynasty, around 2000 B.C. Only a few cities are mentioned in Syria-Canaan throughout these texts. Two sets of Execration Texts exist. In Canaan the only cities mentioned in the earliest Execration Texts are Jerusalem, Ashkelon, and Rehob. Ancient Jerusalem, according to Eric Cline, appeared as "rwsh3mm" in these Egyptian heiroglyphics (Jerusalem Besieged, 16). Various transliterations of the name have been given, including; Roshlamem, or Rosh - ramen, Rushalimum, Urushamem, Urusalim. Cline suggests that these texts suggest the early rulers of ancient Jerusalem were of West Semitic descent, and more specifically Amorite. This seems to be the case, at least, during the time of king David. The Jebusites were of mixed Amorite and Hittite blood, and rulers of Jebus, their stronghold prior to David's siege. Settlement evidence dates to the Early Bronze Age ca. 3100 B.C.-2800 B.C. www.jewishvirtuallibrary.org lists the first houses as being discovered in 2500 B.C. Kathleen Kenyon, the archaeologist famous for her work on Jericho, dates Jerusalem to 2600 B.C., and states it was founded by Northwest Semitic people. Fortifications also exist from ancient Jerusalem. From the Middle Bronze Age comes a sizable collection of segments from fortification walls, fragments of houses and other similar structures and even flooring pieces. Foundations of a wall running down the slopes of the hill Ophel date back to 1800 B.C. This wall belongs to the time period classified as the Middle Bronze Age 2 ( ca. 2000 B.C. - 1600 B.C. ). CNN.com ran an article in 2009 about the discovery of the ancient wall. The wall is believed to have been built by the Canaanites, prior to Israel's settlement of the city. The size of the wall is staggering. It was built straight up to a height of 26 feet. Such walls built today require machinery for construction. The ancients, of course, had no such technology. It was constructed of boulders weighing 4 and 5 tons apiece. The discovered section of the wall runs 79 feet long, however, it is believed to be much longer. The Israel Antiquities Authority released a statement saying the wall likely extends much further to the west, "beyond the part that was exposed". This discovery shed light on the defenses and fortifications of ancient Jerusalem prior to king David. Archaeologists believe the wall to be part of a massive fortification system that "descends to the spring tower from some sort of fortress that stood at the top of the hill". Walls such as this one were used in antiquity to protect from desert raiders and would-be invaders. It secured the water supply for the city. "We are dealing with a gigantic fortification, from the standpoint of the structure's dimensions, the thickness of its walls and the size of the stones that were incorporated in its construction," the IAA statement said. "The new discovery shows that the picture regarding Jerusalem's eastern defenses and the ancient water system in the Middle Bronze Age 2 is still far from clear," said the excavation's director, Ronny Reich.. "Despite the fact that so many have excavated on this hill, there is a very good chance that extremely large and well-preserved architectural elements are still hidden in it and waiting to be uncovered." ANCIENT JERUSALEM WAS DEFINED BY STEEP RIDGES & VALLEYS ON THREE SIDES. OPHEL WOULD LATER BECOME THE SITE OF SOLOMON'S TEMPLE. THE GIHON SPRING WAS USED BY DAVID'S MEN TO TAKE THE CITY FROM THE JEBUSITES. This evidence would seem to support the context for Abram's meeting with Melchizedek as being possible. Salem/Jerusalem would have been occupied during that time, possibly fortified with massive walls. Supposing 2000 B.C. as a general time frame for Abraham, evidence shows ancient Jerusalem had structures ca. 3100 B.C. - 2500 B.C. The site had likely been occupied for quite some time prior to their meeting! The historical context of the earliest Biblical account of ancient Jerusalem can be verified, even if the actual story of Melchizedek as king of Salem cannot. Jewish tradition identifies Melchizedek as Shem, one of the sons of Noah . Thus, according to this line of thinking, ancient Jerusalem was founded by Shem, along with the help of Eber. Both of these are descendants of Abraham. 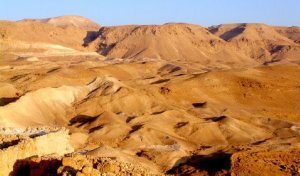 It is widely believed by many Biblical scholars, based on the chronology of Genesis, that Shem may have been alive for part of Abraham's life. 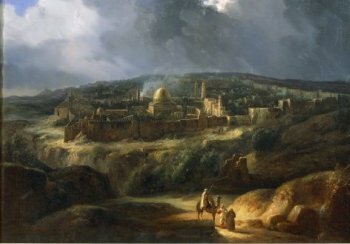 Ancient Jerusalem would have flourished during the urbanization that took place in Canaan during the Middle Bronze Age. Several Canaanite cities have undergone excavation with ruins discovered dating from 2000 B.C. - 1550 B.C. Jerusalem, Gezer, Megiddo, Jericho , Dan (Laish), and Hazor have all been excavated from this time period. From each city we can gleam what ancient Jerusalem may have looked like. The city would have been fortified with immense walls surrounding it, such as the one discovered above. These walls were very thick, constructed of mud-brick set on a stone foundation. Huge stones and boulders, in some cases weighing tons apiece, were roughly fitted together to form the walls. The walls often stood atop massive earthen ramparts made of soil and debris from nearby. We know a "Millo" existed in the ancient Jebusite city, though the exact function of this is unknown. Cities of this time, Jerusalem included, were well built and well planned. Strong fortifications were accompanied by drainage systems, and in the case of Jerusalem and Megiddo, elaborate tunnels carried water into the city, thus enabling the city to undergo a siege. The massive wall was discovered near the water source for Jerusalem, the Gihon Spring. The shaft connecting the spring with the city was what allowed Joab, one of David's men, to sneak into the city and throw open it's gates. 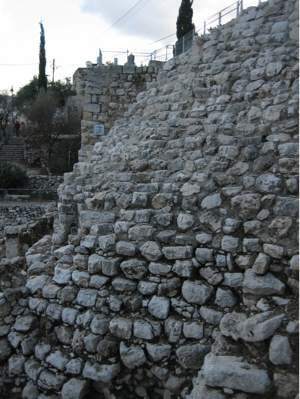 The Jerusalem Stone Stepped Structure, possibly David's Millo from the Bible. 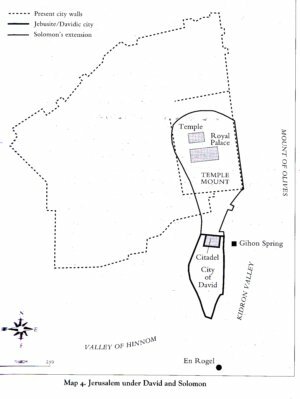 Typical Canaanite cities included temples to their foreign gods. A stone-stepped structure 59 feet high and 42 1/2 feet wide was discovered in ancient Jerusalem. This structure dates back to 1200 B.C. and was part of the Jebusite city David conquered. The Stone Stepped Structure may be part of the "Millo" mentioned above. Administration buildings would have likely been present within the city walls as well. The houses of the rich would have likely towered over the houses of the poor. Ancient Jerusalem appears frequently in documents discovered from the Late Bronze Age. The most famous of these documents are the Amarna Letters, written from vassal kings of Canaanite city-states to the Pharaoh of Egypt. The Amarna Letters mostly date from the first half of the 14th century B.C. ( 1399 B.C. - 1300 B.C. ) and cover the reigns of Egyptian Pharaohs Amenhotep III and Akhenaten. The tablets were written using Akkadian cuneiform logograms. The most powerful city-states of this epoch were, from north to south, Hazor, Megiddo, Beth-shan, Shechem, Gezer and Jerusalem. Hazor was the largest, with a population around 30,000 - 40,000 inhabitants. The Biblical data corresponds with this, as Hazor is declared as the head of a multitude of city-states during the time of Joshua and the Conquest. "I fall at the feet of my lord, the king, seven times and seven times." He continues with the danger to ancient Jerusalem. "They have seized the land of Rubute. The land of the king has fallen away to the Habiri. And now, even a city of the Jerusalem district, Bit-in-ib by name, a city of the king, has fallen away to the side of the people of Qeila. Let the king listen to Er-Heba, your servant, and send an army of archers that they might restore the land of the king to the king. For if there are no army of archers the land of the king will fall away to the Habiri." It is significant that during this time Jerusalem was under the vassalage of Egypt. It's king was subject to Egyptian authority, thus the plea for assistance to pharaoh. In response to Abdi-hepa's plea, Egypt sent a company of fifty archers. These archers were stationed in ancient Jerusalem for an extended period of time. Cline also points out these Amarna Letters are the earliest recorded instances of conflict in Jerusalem. Egypt during this time was in a state of decline, which allowed the Habiru to attack Egyptian interests in Canaan. Many scholars place the Conquest during this time of a weakened Egypt, and find striking similarities between the Habiru of the Amarna Letters and the Israelite Conquest as described in the Bible. This, of course, draws much debate. Regardless, ancient Jerusalem in the Late Bronze Age fell under the watchful eye of Egypt. At some point, invaders attacked the walls of Jerusalem drawing pleas for assistance from its king. 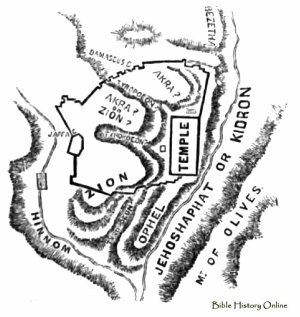 A map of ancient Jerusalem from this time period would include the hill of Ophel only. This ridge was flanked on both sides by valleys, with the southern end of the hill overlooking the junction of the two valleys. Jerusalem during the Amarna Period, and the subsequent Israelite invasion, encompassed eight to ten acres. This would have been a considerably large city for the time and region. Fortifications extended halfway down the steep eastern slope of Ophel. It is likely the city maintained this layout until the time of David. The archaeological remains from the Amarna period, or Late Bronze Age, or few. Most of the finds are limited to structural remains found on the summit of the eastern ridge. Some pieces of pottery were discovered in tombs on the Mt. of Olives. Some of these were imported from Cyprus. 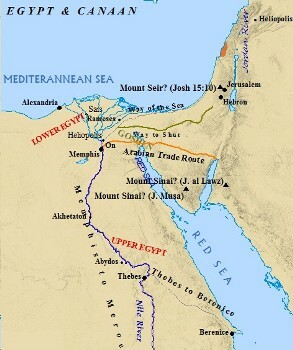 Trade was conducted with Egypt, Mesopotamia, and the Aegean. Extensive roads cris-crossed Canaan, and though Jerusalem was a mountain enclave, it rested on the Central Ridge Road, the main artery of traffic in the hill country. Minoan pottery dating from these early years have been found in Canaan and Syria. Mycenaean pottery from later periods was also found all over Canaan and Syria as well. Interaction with different peoples and cultures was commonplace. In fact, the land of Canaan was in many ways the meeting spot of the ancient world. Within a 1,500 mile radius of ancient Jerusalem was Rome, Chaldea/Ur, Persia, the Arabian Peninsula, and Ethiopia. Athens was equidistant from Jerusalem as Ur was, in opposite directions. Approximately 300 miles southwest of Jerusalem, Memphis rested on the Nile River. Approximately 300 miles to the northeast of Jerusalem the great Hammoth rested on the Orontes River. Due west from Jerusalem was Alexandria, Egypt, which would eventually come to house a large and influential Jewish population. A mere 160 miles to the north was Damascus, center of the Arameans of antiquity, great rivals of Jerusalem's. Aram-Damascus would come to be included among those that laid siege to the walls of Jerusalem. Their siege was done in conjunction with the northern Kingdom of Israel. The history of Jerusalem is littered with references to Damascus and the Arameans. The events of the Late Bronze Age above took place in ancient Jerusalem between the Jerusalem of Melchizedek, mentioned in Genesis, and the city of Jebus, conquered by David in II Samuel 5. At the time of the Israelite Conquest under Joshua, Jerusalem is under Amorite control. The opening verses of Joshua 10 lend insight into ancient Jerusalem. "Now it came about when Adoni-zedek, king of Jerusalem heard that Joshua had captured Ai, and had utterly destroyed it (just as he had done to Jericho and its king, so he had done to Ai and its king), and that the inhabitants of Gibeon had made peace with Israel and were within their land, that he feared greatly..."
The date of Joshua's incursion into Canaan is a hotly debated topic. Theories and dates vary widely. However, the Merneptah Stele, dated to ca. 1230 - 1200 B.C.E, from the reign of the Egyptian pharaoh Merneptah, is the earliest recognition of the state of Israel. This is the first reference to Israel as a recognized nation, thus the Conquest had to have occurred prior to the 13th century. Regardless, at the time of the Conquest Jerusalem was under Amorite control, and sought the help of nearby city-states by forming the Amorite alliance in opposition to Joshua and the Israelite invasion. Joshua 10:3 lists the members of the Amorite alliance. Jerusalem was teamed with Hebron, Jarmuth, Lachish and Eglon. 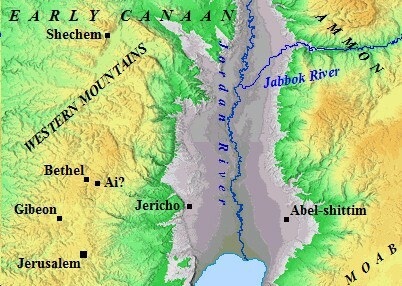 These were the major cities in southern Canaan. Scripture records Joshua never managed to take Jerusalem, or Jebus as it was called. The Jebusites resisted Israelite occupation, though as stated above, the two peoples did coexist, with the Israelite settlements likely outside of the city walls on the surrounding hills and valleys. Judges 1:21 describes such a scenario in ancient Jerusalem. What is interesting is that a conflict did take place between Israel and Jebus prior to verse twenty-one. In Judges 1:8, the "sons of Judah" fought against Jebus, and set the city on fire. Apparently they failed to completely drive out the Jebusites, as indicated later in verse twenty-one. These walls would have been the massive ones discussed earlier. The stone-stepped structure earlier mentioned was likely the work of the Jebusites in Jerusalem during this time period - and later expanded and built upon by King David. Jebus would remain outside of Israelite control until ca. 1000 B.C. David would capture it and name it his capital city Jerusalem. Holman's Bible Atlas claims David captured Jebus in about 993 B.C. This Jebusite city was about ten acres in size. It was primarily built on the southeastern hill Ophel, above the nearby water source the Gihon Spring. By this time Jebus had a well developed fortification system, touched on above, and a drainage system which allowed the city to obtain water from the Gihon during times of Siege. The Bible relates in II Samuel 5 that David captured Jebus through the act of one of his men, Joab, scaling the water shaft into the city. Upon successfully navigating the water shaft, Joab would have stealthily crept into and through the city, throwing open the gates of Jebus to the awaiting Hebrews below. The southeastern hill is now known as the City of David. David expanded ancient Jerusalem to the north along the eastern ridge. The northern part of this eastern ridge rose 250 feet higher in elevation than the southern portion. Mt. Moriah would come to be where Solomon would build the First Temple, and where the Dome of the Rock rests today. The Temple Mount remains at the center of world attention. II Samuel 5:9 hints at David's expansion. "So David lived in the stronghold and called it the city of David. And David built all around from the Millo and inward." The exact function of the Millo is unknown. A structure, tabbed the Large Stone Structure briefly mentioned above, was discovered in 2005. This structure is part of a large public building in the city of David from the 10th or 9th century B.C., or the time of David. It was discovered near the Stone Stepped Structure mentioned above, which dates to ca. 1200 B.C. The Stepped Structure connects to, and supports, the Large Stone Structure. Together these structures may be part of this mysterious Millo mentioned in the Bible. From this point the history of Jerusalem is well documented. The Biblical period of Jerusalem history roughly covers the time of David, ca. 1000 B.C., to the Roman occupation in the first century A.D. A brief mention is made in Genesis, and references are made to Jerusalem during the time of Joshua and the Judges, the dates of which vary. However, the bulk of the material on Jerusalem starts with David. Jesus spent much time in Jerusalem, as documented by the New Testament. The Bible does not cover the time from about the late 4th century B.C. to right before the birth of Christ. This is known as the intertestamental period. Ancient Jerusalem, in conclusion, extends far beyond the pages of the old Testament. Though the city has Jewish roots stemming back perhaps four thousand years, the actual city itself is much older. Chalcolithic evidence indicates an existence during that era known only as pre-history.It is one of the oldest cities on earth, and one of the longest occupied cities in human history. It's association with Israel and the Jews can perhaps be traced back four thousand years. Jerusalem, thus, maintains a sense of the ancient through it's numerous ruins in existence today. It is truly one of the few spots on earth where the world of antiquity interacts with the world of technology, maintaining a truly unique balance of old world and new. THE TEMPLE MOUNT IN JERUSALEM. TODAY THE GOLDEN DOME OF THE ROCK DOMINATES THE TEMPLE'S PRECINCTS.